Chronic hamstrings injury can be a real problem for many patients. Sometimes they show up well on MRI and sometimes they don’t-making hamstrings injury diagnosis pretty tough for doctors. Ultrasound imaging has the advantage of being dynamic, where you can watch the muscle move, something you can’t do with an MRI. The hamstrings muscles connect the pelvis to the knee and are responsible for flexing the leg. Chronic hamstring tightness seems epidemic and many times this is due to an irritated S1 nerve in the low back. These are the patients you see rolling their hammys in the gym, which helps for awhile, but then the issue returns. However, when there’s a single “spot” in the muscle from an injury that’s chronic, oftentimes dynamic ultrasound imaging can “one up” an MRI scanner by showing the muscle in much more detail and allowing it to be viewed in motion, again, something an MRI just can’t do. This is a patient in her 40s who had a right hamstring injury ten years ago and since then has had a “spot” in the middle of the back of her leg that’s “always there”. Many doctors have looked at it and concluded that there was nothing that could be done or detected. 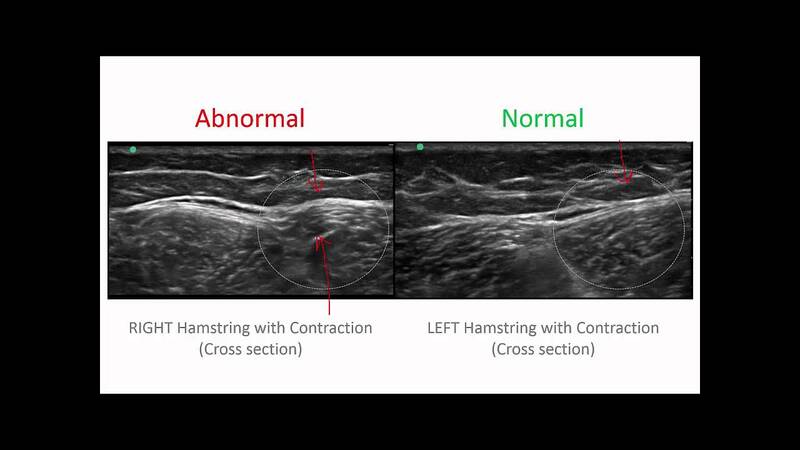 The ultrasound image above is a cross section through the muscle with the patient contracting the hamstrings. On the right, you see how the normal muscle contracts. Watch how the muscle in the dashed white circle contracts and expands evenly. The abnormal hamstrings muscle on the left in the dashed white circle contracts differently. You’ll notice the bottom arrow pointing to the area that seems to “knot up” and twist with contraction. Also notice how the covering of the muscle also expands outward in the left abnormal image compared to the right normal image (down arrows). What can be done for this? We will use our 3rd generation platelet lysate to gently inject regenerative fluid to “hydro-dissect” the scarred down muscle and to allow it to move more normally. We’ll also use our advanced form of platelet rich plasma to help strengthen the blown out fascial covering. That last part is critical, as muscles are surrounded by fascia that helps contain them and this helps provide power and leverage to the muscle fibers. The upshot? As you can see, this is a hamstrings muscle that would likely look pretty normal on static MRI imaging that when viewed with active ultrasound imaging looks abnormal. Now that she has a diagnosis, we can formulate a treatment plan!